BIA’s building inspector operating in Mornington uncovered deteriorating timber stumps. What defects will BIA find at your Mornington building inspection? When moisture marks are evident on and around the base of timber stumps (like the one in this photo) it usually indicates that the stumps are rotting below. 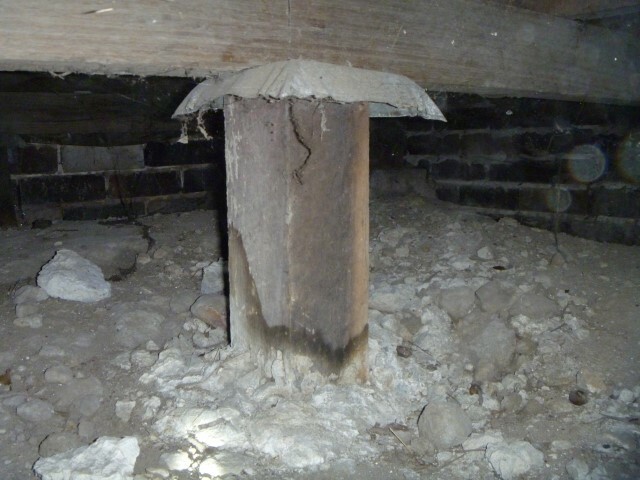 Moisture can travel underground laterally and cause damage to the stumps from the bottom up without being noticed. Some timbers are very durable and therefore will not rot at a rapid rate; however timber in ground will always deteriorate if moisture is present in the area. At this Mornington Property Inspection the client was advised to consult a drainage specialist for advice on what drainage is required to remove excess moisture from the subfloor and around the building exterior. Furthermore, a re-stumper was contacted and quoted $8000 to replace damaged stumps.